Main Informations: What is Koodiyattam? Koodiyattam is a traditional form of theater in Kerala , India . It is literally means "acting together". Based on Sage Bharatha's 'Natyasasthra'. The origins of this in Sanskrit drama theatre is listed more than 2000 years ago suggested, in its present form it is about 1000 years have been documented since. 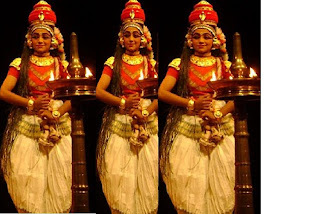 But one of the scholar says that ' Koodiyattom is the one of the earliest classical dramatic art form of South India especially Kerala and it is evolved in the 8th century AD.' A number of performers get together Instead of single Chakiyar and stage dance-drama. So that is why it is called Koodiyattom. That means literally "Dancing together".The texts are recited in different pitches and with facial expressions and gestures explained and accompanied by harp music. The stories are so detailed that a single act can take several days to deliver performance. Traditionally, the pieces of actors box Chakyar and Nambiar in Hindu temples played. The late Guru Mani Madhava Chakyar is one of the most famous personalities of Koodiyattam Theatre. The performances of his troupe on secular platforms have made Koodiyattam a wider public. He made the plays Abhijnanashakuntala including choreography, and Vikramorvashiya Malavikagnimitra of Kalidasa on stage.